It may seem early to start thinking about fall — as the days grow longer, temperatures increase and the workload may, too. But once the summer sun has reached its zenith, the crops you plant thereafter will be growing and maturing in gradually shortening days and cooling weather. It's time to start planning your plantings so crops are ready to harvest when you need them, right into the end of the season. Start planting varieties that are adapted to mature in cooler temperatures. Plant several varieties of the same crop that have different days to maturity. Incrementally time successive plantings more closely together, as they will be maturing more slowly into the fall. Adopt season extension technology for crops that mature into the fall, to cover and hold them in the field without damage from early winter weather. See below for more information on each of these strategies. Crops are bred for various traits, including heat and cold tolerance. Within a crop, some varieties perform better in cool weather and some in warm weather. If you grow only one variety, you may find that it falls short of its potential at some point or another during the season. By growing several varieties, you can span a longer season and still offer consistently high quality. Depending on the crop, our planting plans recommend different varieties depending on the time of year, and/or planting multiple varieties with different maturity dates to spread the harvest from a single planting. Succession planting systems can become increasingly more refined, complex, and productive with experience. The intervals can be tweaked by factoring in regional or individual farm-record data, and by adopting more innovative and advanced techniques, such as season extension methods. 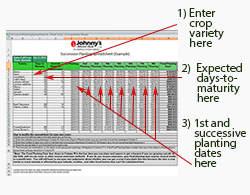 Johnny's Research team has created a set of charts showing recommended planting intervals for crops especially well-suited for repeated plantings of the same crop. Input your first frost date and the average days to maturity for your chosen variety, and the calculator will display appropriate dates on which to make sequential plantings. The timing between successive plantings on these charts relates to the average days to maturity for the crop or variety listed. Keep in mind that the intervals between plantings shown here are based on standard growing practices — in reality, optimal planting intervals are also contingent upon local frost dates; growing conditions; and methods of planting, growing, and harvesting. Planting tips and notes are provided, and the charts can also help you decide which crops to grow concurrently. To forecast the dates of your successive plantings, try our Succession Planting Calculator. The chart denotes crops that are customarily started indoors for transplanting versus direct-sown. You also can use a combination of transplants and direct seeding to effectively succession plant. For example, grow transplants of crops you normally direct-seed, such as arugula, cilantro, cucumbers, parsley, spinach, squash, and sunflowers. When you plant them outside, direct-seed some of the crop at the same time. The transplanted crop will be ready for harvest first, and the direct-seeded crop will mature a few weeks later. Planting programs differ from interval succession planting in that they generally involve planting crop varieties that have varying days to maturity, as well as planting different varieties depending upon the season, to produce a continuous supply. As with interval succession planting, many growers apply season extension methods as an integral part of their planting programs. Visit the Planting Programs section of our website to learn more about the details of implementing a successful program. 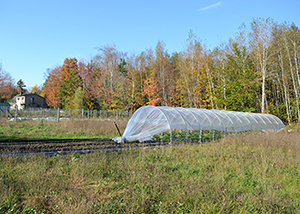 Finally, protected cropping bears mention, as it can help you expand the limits of your growing season significantly, allowing for production earlier in spring, later into fall and winter and, for some growers, year-round production. For cost calculators, parts lists, and construction manuals for a variety of tunnel designs, see the Season Extension section of our Tools Library. 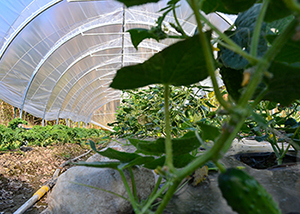 Plant low-growing crops such as greens in Quick Hoops™ low tunnels, or cover them with floating row cover or Quick Hoops to hold them in the field when cold weather arrives. Cover peppers and eggplants with row cover to help them survive the first frost or two. There is frequently a return of mild weather following the first frost, that can help some tender crops survive into that period. Plant a late crop of determinate tomatoes in a hoophouse, or keep a main season planting of indeterminate hoophouse tomatoes productive after field crops have slowed down. Plant cold-loving crops in early autumn in a hoophouse or caterpillar tunnel to harvest all winter. Overwinter some crops under Quick Hoops to give them an early start the following spring. Succession planting may seem complicated at first, but with practice you'll get the swing of it. Start with a few main crops and project your harvest dates, then use these four strategies to find opportunities to extend the harvest. Do the same thing with additional crops next season. Try a few new varieties from the Planting Programs to see how they produce for you. Experiment with high tunnels and low tunnels. Keep track of the details, then analyze the results. 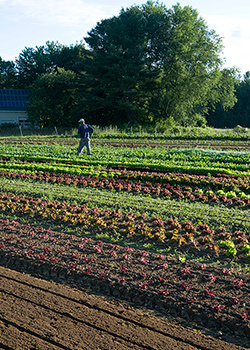 You'll soon be on your way to creating a succession planting plan that provides for abundance and quality — and strong sales — over the longest possible season.